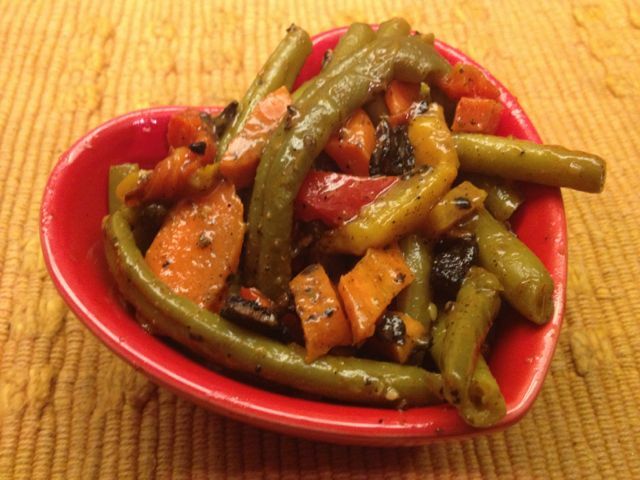 Green Beans with Grilled Carrots and Colorful Bell Peppers with Bacon Dressing. Heart shaped bowl is optional. When planning a meal on the Grill, feel free to get creative with the Sides. From Grilled Caesar Salad, to Grilled Veggies or Smoked Potatoes, there is always enough Grill space to slide in a Side Dish. Frozen and Microwave side dishes can cost up to 5x times more than using Fresh Vegetables. Rather than Nutrients, you get added chemicals and preservatives for the extra price. 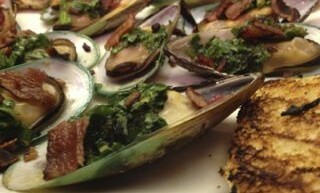 You can use a well balanced Spice and Herb blend in addition to the traditional Salt, Pepper and/or Butter. It will add an all new dimension. POWER Rub has low levels of Salt and Sugar to bring out the flavors. While HEROIC! is all-natural, with no added Salt or Sugar. It is also a perfectly heathy way to season Vegetarian Side Dishes. You won’t miss the Fat. The Vinegar based Dressing brings a tangy kick to the party with Steak, Chicken and Potato dishes. Boil, Steam or Microwave Green Beans for recipe. Use your favorite commercial Italian/Balsamic Dressing or Bacon Vinaigrette. The Smoked Bacon adds a nice homespun taste. For Vegetarian, skip the Bacon. -Cut the Yellow and Red Bell Peppers, in Half (lengthwise) and remove seeds. -Peel Carrot, and cut lengthwise into 3 thick Strips. -Mix 1 cup Italian Dressing with 1 tbs. each Garlic, Thyme and 2 Tbsp. BBQ Rub. Marinate Veggies for 10-15 minutes. – Smoke Bacon on Grill over Medium High indirect heat, flipping once until crispy (may also bake or fry if no Grill). Chop half of Bacon into small bits and add to remaining Italian Dressing. -Use outdoor Grill or Grill Pan to cook Peppers and Carrot until tender. Then dice into small pieces. -Wash, then cut tips off of Green Beans, Boil, Steam or Microwave. -Mix hot Beans with Chopped Veggies, Italian Dressing Mixture (to taste) and Remaining Bacon. May also add Salt and Pepper.